A home health aide, certified nurse assistant, or nurses’ aid provides personal care, help with transfers, walking, exercise; household services that are essential to health care; and assistance with medications. In addition, a home health aid will report changes in your loved one’s condition to a supervising RN or therapist; and will complete appropriate medical records. Once you have decided on the type of help you need, you can either hire someone yourself-by placing an ad in a local newspaper or taking recommendations from family or friends — or you can go through a home health care agency. 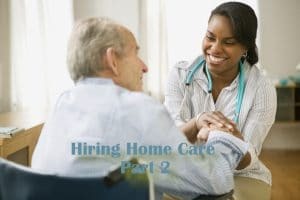 Home health care agencies focus on the medical aspects of care and provide trained personnel, such as nurses and physical therapists. Medicare may pay for these services, if they are ordered by a physician. If the agency is JCHAO (Joint Commission on Accreditation of Healthcare Organizations) accredited and/or Medicare certified. Which services are covered by Medicare. What type of employee screening the agency performs. Whether you or the agency will be responsible for paying the worker. Whether you or the agency is responsible for supervising the worker. What types of general and specialized training the workers have. Whether the same person will care for your loved one each day. Who to call if the worker fails to show up. What fees the agency charges and what types of care each fee covers. Whether the agency offers a sliding fee scale. If fees vary for care provided during nights, weekends, or holidays. The minimum and maximum hours of service. Any limitations on tasks performed or times of day when services are furnished. This is information has been supplied by Becky Eizen of Feinberg Consulting, Inc.
class="post-template-default single single-post postid-13563 single-format-standard samba_theme samba_left_nav samba_left_align samba_responsive wpb-js-composer js-comp-ver-5.7 vc_responsive"